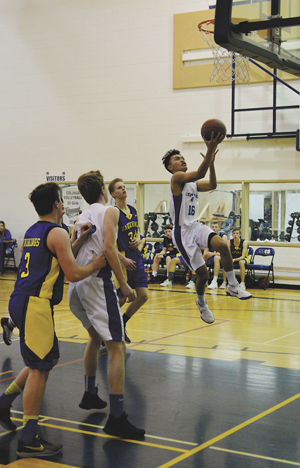 St. Mary’s Celtics varsity boys basketball team got an early jump to the hardcourt season with a last-minute invite to a tournament in Coalhurst over the weekend. “They were short a team and we were able to get in,” said Ken Gabruck, head coach of the St. Mary’s Celtics varsity boys basketball team, adding the Celtics were able to win the consolation championship after facing a tough Coaldale Christian team in the first round. The Celtics fell 76-63 to Coaldale Christian, with the Celtics only trailing by two at the half. Tyrell Martens had the double-double of 10 points and 13 rebounds. Carter Hendricks poured in 17 points and Emanuel Adra had 13 points. Beau Huseby added 10 points. The Celtics dominated in their following game in a 98-42 dismantling of Kate Andrews Pride junior varsity, as plenty of minutes were spread around. Carl Rodrigo hit for 20 points and Hendricks and Peter Klassen both added 14 points. “We were up 20 at half and then outscored them 35-4 in the third quarter,” said Gabruck. The Celtics’ consolation championship featured an 85-40 victory over Milk River. Martens had another double-double, with 15 points and 10 rebounds. Seth Muller and Rodrigo each had 14 points and Jonathan Vanderbeek had 10 points. “We outsized them a little bit and then we switched from man to zone where we were able to outrebound them and run with the ball,” said Gabruck. The tournament made for a good primer for the Celtics’ River Ridge Basketball League season which starts today. “There were times where we looked really good and other times we struggled where you could see the rust — it’s early. Our passes weren’t crisp and it led to some unforced turnovers — but you will see that in the first month of the season,” said Gabruck. The Celtics varsity boys basketball team features a 10-player roster this season with three Grade 12s, four Grade 11s and three Grade 10s. The Celtics travel to Picture Butte this weekend for a tournament with a tournament at Kate Andrews the following weekend. “Getting three tournaments in December is nice. It’ll give us along with a couple of league and exhibition games a lot of ball games in December, and give us a pretty good idea of where we will be at by the end of the year,” said Gabruck. River Ridge Basketball League technically starts today, but with no boys team in Foremost, the Celtics will instead play an exhibition game with Coaldale Christian at 7:45 p.m. at home while the St. Mary’s Auroras girls basketball team will play Foremost at 6 p.m. The Celtics host Vauxhall Vikings on Dec. 12 at 7:45 p.m.
Interest was high for Celtics basketball this year, which will also feature a junior varsity team, who will be playing in a tournament in Milk River this weekend.